Can we handle the naked truth? Well, drinking buddies, Stumble Zone Part Deux is a done deal, and I’m happy to report that there were no casualties (other than the credit limit on my Visa card). A detailed account of our exploits will be forthcoming, but I just wanted to lay a teaser on you. Hint: We were downtown. Second hint: We ended up at a strange and wonderful bar where women remove articles of clothing in exchange for dollar bills! Can you imagine? Which brings up today’s topic of discussion, that being strip joints. I’m opening the phone lines for your opinions on the matter. 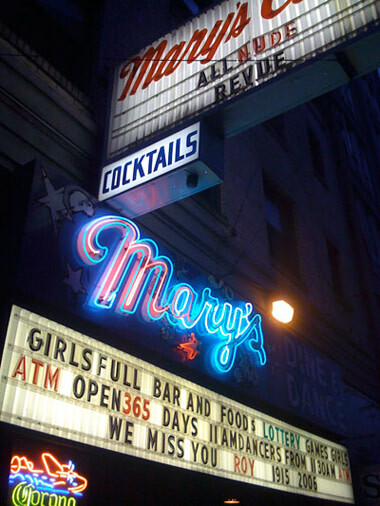 Are places like Mary’s Club citadels of worship dedicated to the infinite beauty of the female form, or tawdry tents of sleazery and oppression inhabited by the dregs of humanity? Sorry, those are your only two choices. (Kidding! Kidding! Shades of gray are greatly encouraged. Fanaticism of any kind is such a bore.) I mean, we’ve got more strip clubs per capita than any city in the U.S. of A. What purpose do they serve? Is this part of a larger, more libertarian discussion? Please chime in. BTW, anyone got change for a twenty?